The Weirding Storm is Published! 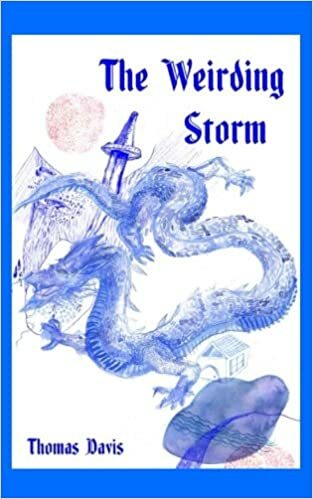 The Weirding Storm, A Dragon Epic has been published by Bennison Books. It is now available at amazon.com. The address for Bennison Books, a UK publisher, is: https://bennisonbooks.com. I am hoping that anyone who purchases the book from Amazon, either U.S. or U.K. Amazon, will also review the book. That helps publicize it in the amazon universe. I am really excited about this publication. Bennison Books publishes some of my favorite poets and to be part of their stable with one of the best books I have ever written gives me an euphoric feeling. 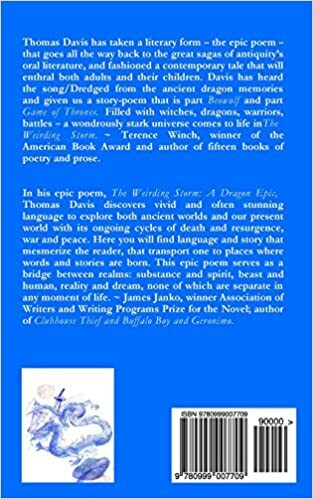 I hope some of you will be willing to be transported to another world where dragons and humans still co-exist along with witches, warriors, and battles, to paraphrase Terence Winch, one of the U.S.’s greatest poets. Thank you ebbtide. I saw that you have poems in Indra’s Net being published by Bennison. That’s really cool. Congratulations to you too. I do, thank you! I was happy to see a few people I’m familiar with included. Can’t wait! Thank you eremophila. We work on these books for years and when they come into being it does feel good. This is exciting, Thomas. Congratulations! Thanks Betty. I see you have a poem in Indra’s Net by Bennison Books. That’s exciting too. Congratulations to you. You are such a superior poet. Thanks very much Thomas. That’s so nice of you to say. I’ve been thinking of you and Ethel today. Tom, my younger son just died suddenly and unexpectedly yesterday. He was just 44. How do you get through this? Nothing as painful as this. Forgive my telling you here on your post but wanted you to know that i now understand the depth of your grief on losing a son. Betty, I’ve responded to your news via email. I hope I still have the right email address. If not, can you let me know so that I can post it here? You know that I loved the book in its first form and your editing and revision can only have improved it. I am so glad to see that it has now been accepted by Bennison. Well deserved. I hope you come to to sell many copies and help change the world we live in. Ben Naga, you provided a valuable service to me when The Weirding Storm was still in its infancy by helping me make sure all of the dragon’s names were handled correctly. Some of your other suggestions were will taken too. As soon as I get my order in I’ll be sending you a copy since I acknowledged your contribution in the Acknowledgments. It should be on its way as early as late next week. John, I’ll be sending you a copy when I get one. I really appreciated your forward. Thanks so much. You are a great poet. I’m hoping to buy another one of your books one of these days. That’s extremely kind of you Tom. Thank you – I shall be proud to have a copy. All the best to you and Ethel.